Despite her recent worry about not having enough "girl toys," Elizabeth is delighted to play with her wood train set. Most of the time, mommy sets up the track, but Elizabeth and Helen have a ball creating towers and bridges to decorate the train track. This "tunnel" structure seems to have taken on a life of its own! 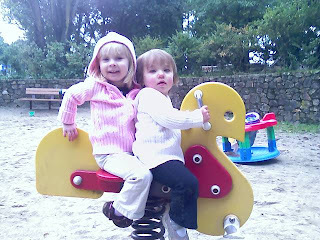 Helen and Elizabeth love visiting our local park in Montclair. There are slides, swings, ducks, lots of sand, and this little ride. Amazingly, they share very well out at this park, and the bonus with this playground is that it is fenced in and only for kids under five years old. 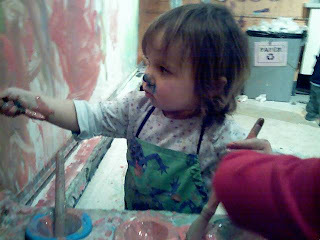 Helen received her first experience with paint, at a recent visit to the Habitot Children's Museum in Berkeley. Her big sister absolutely loves to paint, but until now, Helen really hasn't had the opportunity. I'm sure it won't surprise anyone that Helen was not afraid to get messy! And we've also become members of the Oakland Zoo, which has a small area with rides for the kiddies. 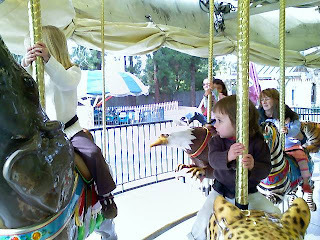 Of course, Helen and Elizabeth are too small to ride anything except the Merry-Go-Round (with mommy supervising) and the train ride that goes around the zoo, sort of. Helen loves animals, and was thrilled to participate in a trip to the zoo today. She is especially fond of birds and cats, but perhaps only because they are the most prominent animals in our regular space. Today, she was enchanted by a pair of tree frogs, walking along in front of their indoor habitat. I don't think I ever see her get so excited by anything else. Elizabeth and Helen receive their daily preschool lesson in the bath. We don't have a chalk board, and the white board pens are smelly, but we do have bath crayons! Everyday (if we are home), we watch Sesame Street and write down the number and letter of the day. We also pick out some theme that they are using (today it was cats) and read books about that and I try to find some activity or art project that utilizes that idea. Elizabeth has handwriting exercises for the letters and Helen gets a coloring page. And most of it is available online for FREE, with the exception of printer ink cartridges, crayons, and my annual support pledge to PBS.